The Cinemas - Season 1 Episode 2 from studioanansi on Vimeo. Sir Sidney Poitier, a Hollywood icon and legend joins Travolta Cooper for the second installment of the series The Cinemas. "I was genuinely surprised when he agreed to do it" said filmmaker and host of The Cinemas, Travolta Cooper. "I asked him and expected him to say 'no'. Sir Sidney is mentor and almost father-figure to me and I know how sought after he is. He has turned down numerous appearances in America and around the world including, one of my favorite shows, '60 Minutes'. And that's not because of arrogance, but rather humility," continued the filmmaker. "Despite the 'icon' that he is, he's a very private person, and he puts great care into what he'd like to say publicly and holds his social responsibility to the masses with great weight. When you see the show, you'll know that there is something important he wanted to say to 'Cariwood'," explained Cooper, referring to the Caribbean film industry. "As some know, I've met with him on various occasions. He was one of the inspiring forces of my film The Black Moses. I have always wished for as many people, filmmakers in the region in particular, to have access to Sir Sidney through the show. I desired that he speak into as many lives in the region as he has into mine." Travolta expressed that Poitier's presence on The Cinemas comes on the heels of the wrap-up of their Smart Phone Film Contest, making it great timing as it takes us to the second phase of development in the series. The Cinemas was designed to be more than just entertainment, but a proactive movement inciting and encouraging a Region Film discourse and industry. In this episode The Cinemas will review the Caribbean film God Loves The Fighter, Cinderella, and Focus.
" Buck and The Preacher" the first film directed by Sidney Poitier is the Caribbean Classic. Before their was Django Unchained, there was Buck and The Preacher. The show wraps up move the the next phase of our Smart Phone Film Contest. 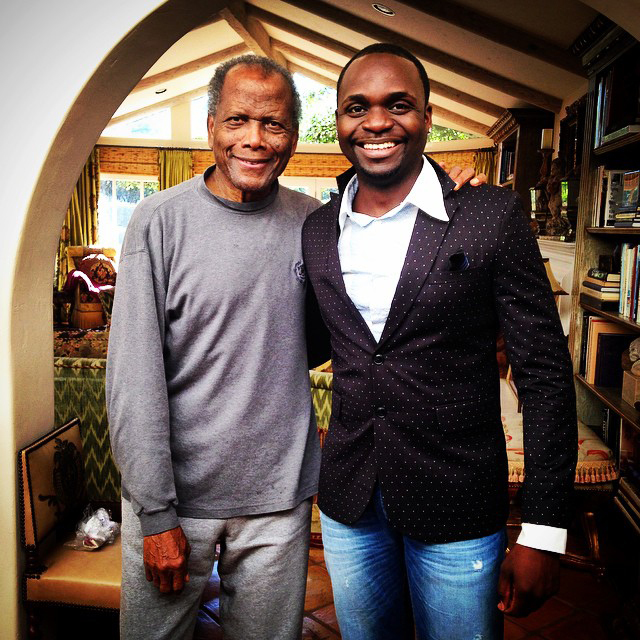 And in a sit down discussion, Sidney Poitier has words he would like to share with the Caribbean and the world. The Cinemas is the brainchild of its host, Bahamian writer, director, and producer Travolta Cooper, who began the show as a result of an endorsement deal with The Bahamas’ movie theater chain. At heart, The Cinemas is designed to promote and encourage the new wave of Caribbean Cinema happening in the Region and around the world. The show consists of movie reviews and interviews with a Caribbean twist. Segments may also feature a cast of Leah Eneas, Rouen Robinson, Toni Francis Timico Sawyer, and Inigo Zenicazelaya.